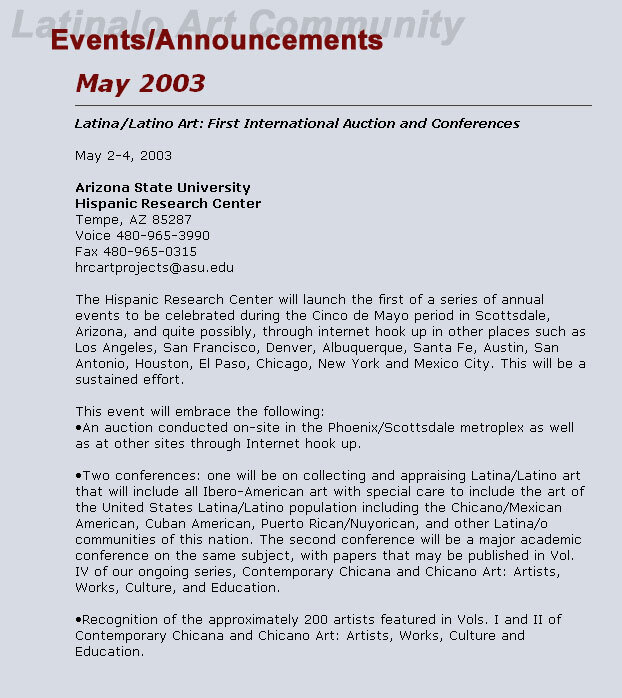 In 2003, Dr. Gary Keller of the Hispanic Research Institute at Arizona State University assembled and produced 'the first International Latino Art auction'. Seventy-five contemporary 'Chicano' artists were invited to submit work and 194 works were selected. The auction featured works of such luminaries as Pattsi Valdez, Frank Romero, Gaspar Enriquez, Chaz Bojorquez, Robert Sifuentes, and Santiago Perez. Jerry De La Cruz was among the 75 invited artists. Though not the largest work in the auction by far, it was one of Jerry's works that brought the highest hammer price of the auction for a single work. Jerry also ended up selling the most number of works of any artist and proved the highest selling artist of the entire auction.